As Easter draws near, the days get longer and warmer. Nature invites outdoor festivities and the barbecue makes a comeback after the winter break. 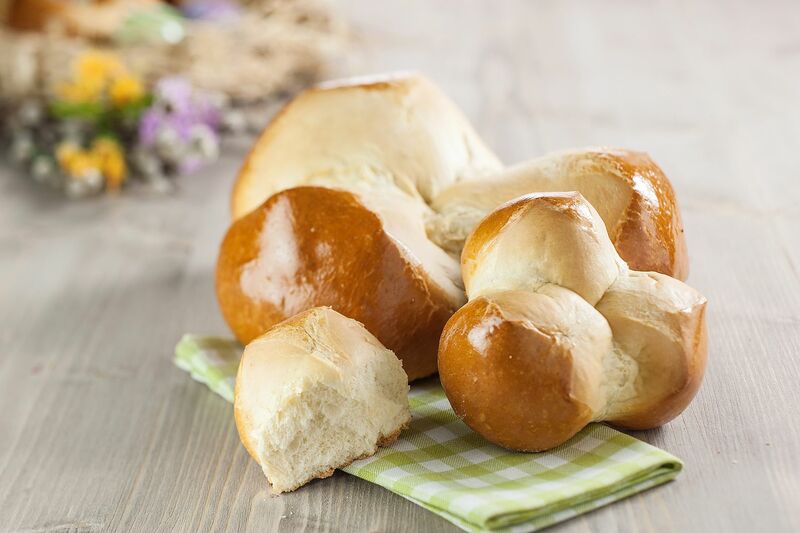 At backaldrin, April is all about sweet temptations for Easter and a variety of bread and roll creations to accompany grilled foods. 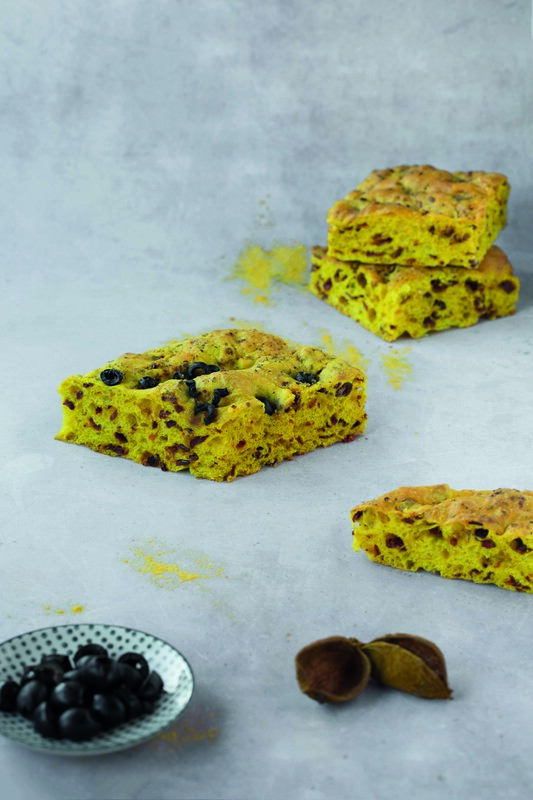 Eastertime is filled with all sorts of traditional baked goods, and backaldrin offers not only high-quality raw food materials but also a variety of classic recipe ideas. 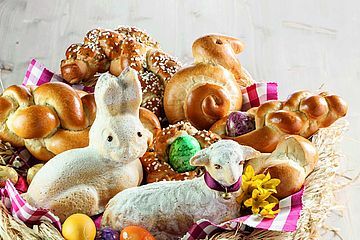 Viennese Pastry Mix, Viennese Spelt Mix and BiskuitMix Fine, for example, are the ideal basis for beautifully baked Easter bunnies or lambs. All three batters are easy and reliable in production and baked goods have a fine flavour and juicy mouthfeel. 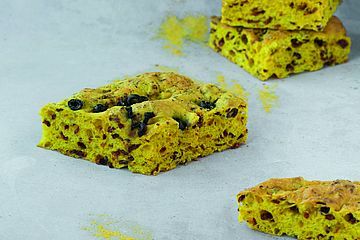 Easter Pinza bread is also a must. 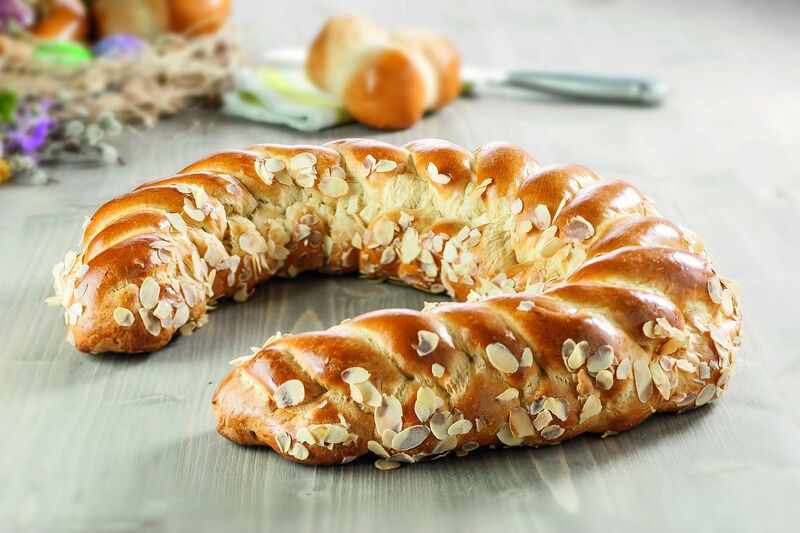 The backaldrin master bakers offer two tried and tested variants for the yeast dough – one with Austria Krapfen Mix and the other with Viennese Yeast Dough Soft. 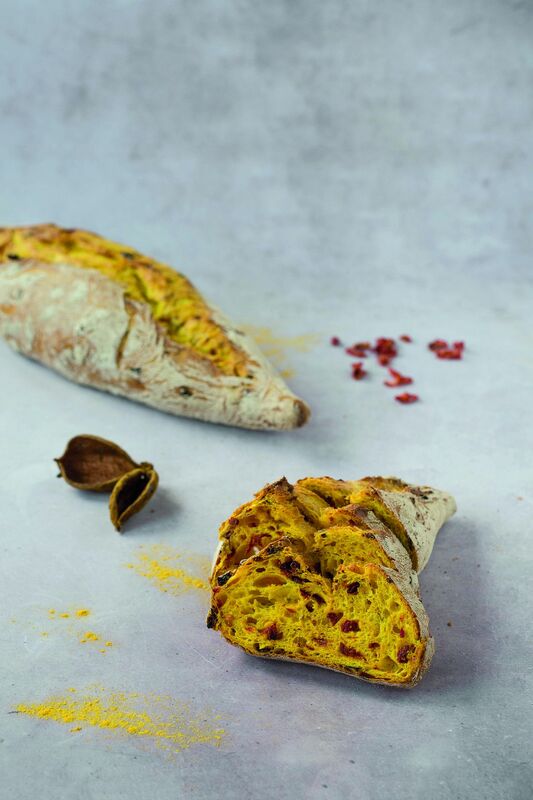 In both cases, the Pinza bread has a balanced taste and a convincingly light and juicy crumb. Easter butter bread and Easter wreaths make for a change from the classics. 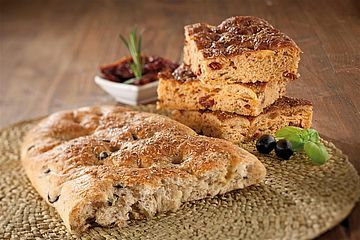 As with the Pinza bread, these are also yeast pastries, but enriched with raisins and almonds. backaldrin offers recipes based on Butter Berliner Premix, Viennese Yeast Dough Soft and Premium BerlinerMix. Nibbed almonds or sugar crystals can be sprinkled on for the perfect finishing touch. With such varied recipes, there are bound to be Easter goodies for every taste. Why not expand the product range with barbecue breads for the upcoming holidays? backaldrin’s master bakers have the perfect bread and roll ideas. 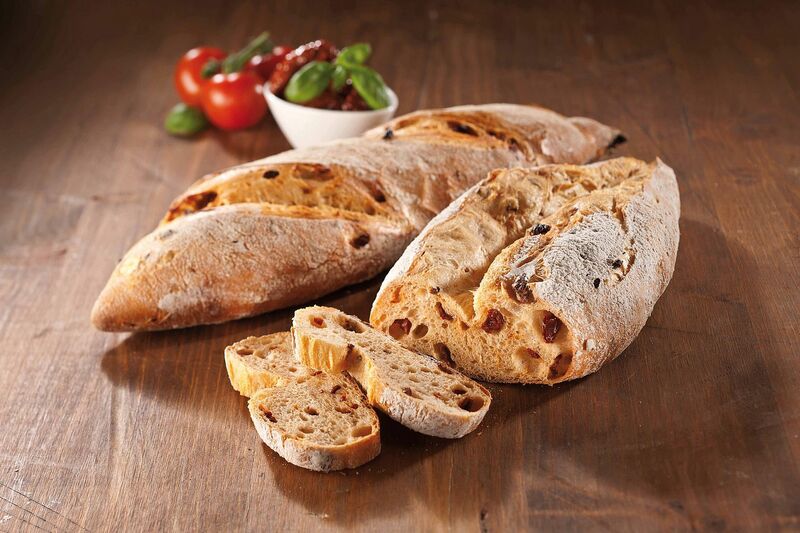 CiabattaMix 10% is a premix with wheat sourdough for the reliable production of ciabatta and other Mediterranean wheat breads, like the pointed baguette with sundried tomatoes. Weizen Premium is suitable for the production of wheat bread and rolls, such as grill flatbreads, which get an oriental touch with sesame and black cumin. The dough for the triplet is shaped lengthwise and segmented into three parts with the edge of the hand, but not cut through. In this way, the crispy bread with the soft crumb can easily be broken into thirds. For garlic bread, backaldrin offers a tasty version made with KornMix direct. Spelt and rye rolls are also perfect for the barbecue season. Spelt 100% is free of wheat flour and contains a high proportion of grains and seeds. 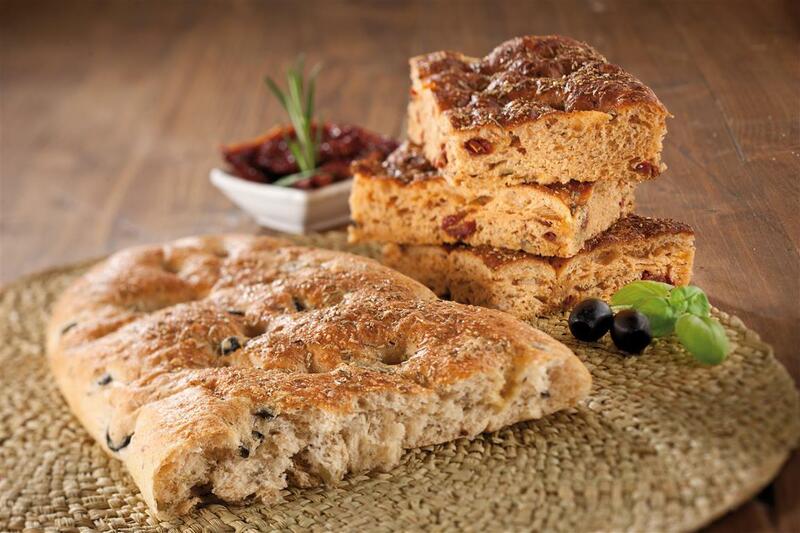 Through the addition of Italian herbs, the spelt focaccia is an aromatic highlight. By contrast, Rye Mix can be used to deliver the likes of rye olive rings and rye twisters. It’s an irresistible range for any barbecue lover. The Kurkuma grill recipes by backaldrin’s master bakers offer even more variety and colourful highlights. Thanks to the wide scope of application in terms of shape and size, numerous creations are possible, from classic Italian ciabatta and Mediterranean flatbreads with olive and tomato to aromatic focaccia. The products are characterised by excellent fermentation stability and good oven spring, resulting in a pleasing volume and pronounced bloom. 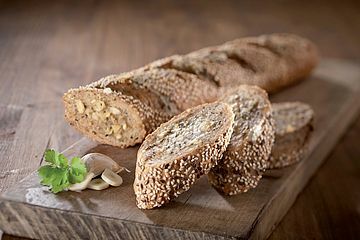 The impressively elastic crumb slices and spreads well. 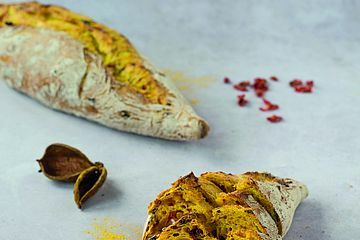 Because of the turmeric, these special baked goods with their intensely yellow crusts are a real eye-catcher on the bread shelf. Apart from a summery look, the pleasantly mild, somewhat spicy taste makes these creations the perfect accompaniment to a cookout.